Quality Door & Hardware, Inc. Announces Its Choice of Sargent 8800 Rim Exit Device as a Featured Product for December 2015. Quality Door & Hardware, Inc. announced today that its choice for featured product for December 2015 is the Sargent 8800 Rim Exit Device. Sargent manufactures a full line of exit devices providing the best combination of simplicity, strength, durability, aesthetics and innovation. Among this full line, the Sargent 8800 Rim Exit Device, is an excellent choice for standard width stile applications on wood and metal doors. The Sargent 8800 Rim Exit Device sets the industry standard for durability and reliability and features both quite operation and solid security. These Sargent Exit Devices are rated A156.3-2008 Grade 1 and are UL Fire and Panic listed. The Sargent 8800 series of Rim Exit Device features several electric options and is available in door widths ranging from 24" to 48." These superior quality Sargent Exit Devices are also available in your choice of a wide variety of brass, chrome, bronze and stainless finishes. 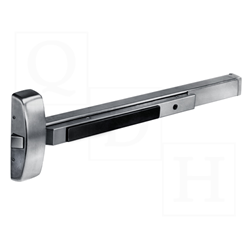 Quality Door & Hardware invites you to learn more about the Sargent 8800 Rim Exit Devices and all of the other fine quality commercial door hardware products featured on our site at http://www.QualityDoor.com. As always, all of our products are offered at everyday competitive pricing and backed by our unparalleled customer service. Come visit our site and experience for yourself "the difference that 'Quality' can make in your business."